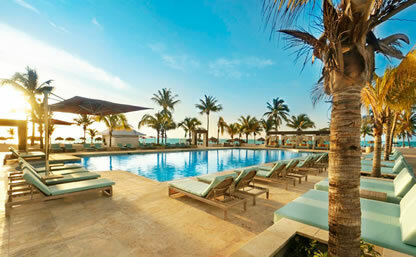 Viva Wyndham Resort is an all-inclusive, 26-acre, resort on the south shore of Freeport, Bahamas. 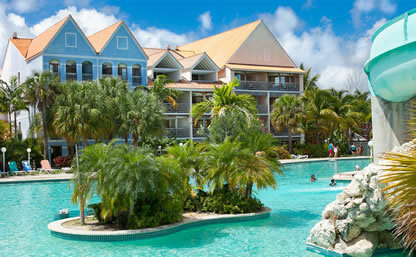 Full of palm trees, wildlife, and white sand beaches, Viva Wyndham Fortuna Beach, is an island in paradise. Experience the beauty of the surroundings while partaking in exciting onsite activities, hard surface, lighted tennis courts, nightly shows, entertainment, Seasonally themed parties and entertainment. Take a swim in the pool, splash in the beach, just steps away. Have fun kayaking, oceanfront volleyball, and snorkeling adventures, or simply relax on the secluded sun-kissed beach. Three onsite restaurants offer delicious international cuisine. Vacations at Viva Wyndham Fortuna Beach include accommodations, all meals and snacks, unlimited beverages, cocktails and wine, kid’s club, selection of water and land sports, theme nights and the most striking shows, as well as discothèques and a myriad of entertainment options for all tastes. The Viva Wyndham Resort all-inclusive resort, has 274 guest rooms balconies or terrace with breathtaking views, creating the perfect spot to unwind after an action-packed day. All of our guest rooms are located in lovely Victorian style structures, adding to the utterly charming ambience. Viva Wyndham Fortuna Beach Resort A mere 19-minutes from downtown Freeport, Bahamas, this island resort is set on the Atlantic coast. It features 274 rooms with stunning views. It sits on a private beach and offers water activities, including snorkeling and windsurfing. Island Seas Resort Island Seas Resort guest rooms are luxurious to the core. Each spacious, one or two bedroom suites features tasteful decor, a pull-out sleeper sofa, and a full kitchen. Additionally, they have balconies overlooking the marina, courtyard and spectacular ocean views. Taino Beach Resort Surrounded by clear blue sea, white powder sands and lush tropical landscaping, this Resort offers privacy, intimacy and charm. 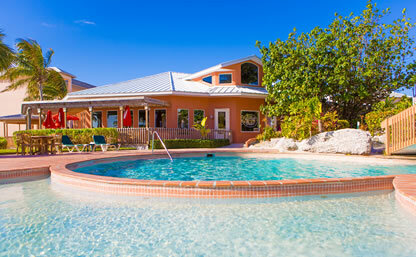 A lagoon style pool with waterslide, waterfalls, caves, lazy river and swim up bar joins their beautiful private beach. 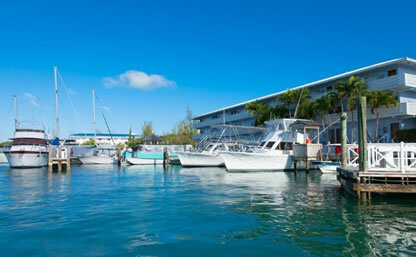 Flamingo Bay Hotel and Marina Flamingo Bay Hotel and Marina is located on Grand Bahama Island, about 200 yards from Taino Beach. 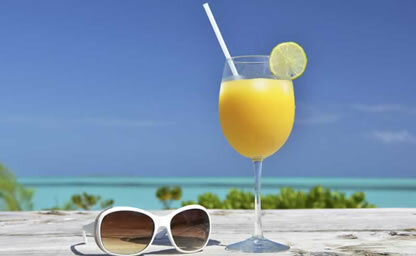 Cruise to Stay™ 2 nights on the ship and 2 nights at The Flamingo Bay Hotel and Marina. it's made up of 64 clean and comfortable rooms overlooking the ocean and the Marina. 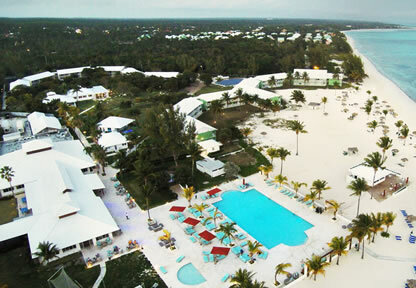 Pelican Bay Resort is on the southwestern end of Grand Bahama Island. Just a few miles away, guests can shop and dance at the Port Lucaya Marketplace, try their luck at the Bahamas Princess Casino, or simply play golf at the nearby courses. Additionally, kayaking, snorkeling, scuba diving and swimming with dolphins are among the many activities guests can enjoy. There are 186 non-smoking rooms and suites at the Pelican Bay. Each has a separate living room and private balconies. Cable TV and Wi-Fi, mini-fridges and coffeemakers are also available. Lunch and dinner are served at the restaurant overlooking the marina, while a second restaurant also offers breakfast with views of the ocean. Enjoy a walk to the beach, or lounge by one of three outdoor pools. The Resort’s concierge can arrange childcare and turndown service. 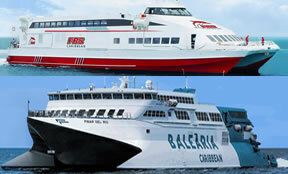 Finally, Grand Bahama International Airport is conveniently just six-miles away. Grand Lucayan Resort With its beachfront location, ample golf courses and a variety of dining options, the Grand Lucayan Resort in Grand Bahama Island offers something for everyone. The 540 non-smoking rooms include cable TV, a coffeemaker, a safe, a desk and an easy chair. 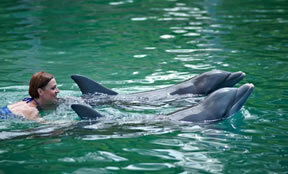 Take the 2 night cruise to swim with the dolphins in Freeport Bahamas. © Hotel411.com, Inc, Travel411.com, Inc.. All rights reserved.